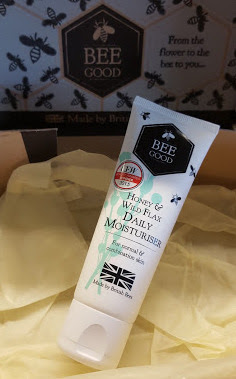 Bee Good are a UK company I've reviewed for before and I still feel their Intensive Hand Cream is the best I've ever used. The Honey And Wild Flax Moisturiser is a great everyday moisturiser for most skin of any age or type. Light, easily absorbed and with a gorgeous scent which makes me think of Spring and Summer meadows, this is my new handbag essential. 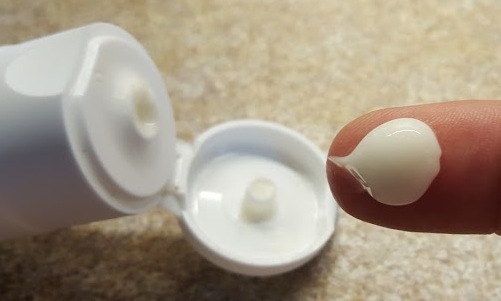 I have dry skin and use a night time moisturiser overnight, but quite often find my forehead and cheeks dry during the day, so I do tend to reapply moisturiser more than most people. The Bee Good 50ml tube is perfect for carrying with me in my bag - it's not heavy and it won't break or leak. Although I'm allergic to bee venom, I'm fine with Bee Good products as they only use the Honey, Propolis and Beeswax, as well as other carefully chosen products sourced in the UK wherever possible. As honey is made of some sort of magic and will never ever go bad, no extra preservatives are needed. Bee Good don't use synthetic colours, mineral oil, silicone, SLS and SLES or parabens, or ingredients from Animals other than those which can be carefully harvested, so all of their products are vegetarian. Bee Good care for their bees and all others, and give a percentage of their profits to UK Bee charities. There is information available on their website to tell us how we can also help our native bee population. I like the Bee Good Honey And Wild Flax Everyday Moisturiser a lot. It isn't at all greasy, and it is a nice gentle moisturiser which won't give you a shiny or sticky face. It soaks in immediately and leaves my skin feeling soft and smooth. The scent is light and fresh, and not overly floral. It works very well under make up, and after 2 weeks use my skin is definitely less dry than before, with less reddening and a more even tone. Bee Good Honey And Wild Flax Everyday Moisturiser currently retails at £19.50 for 50ml, and as would be expected from a product of this quality, a little goes a very long way. 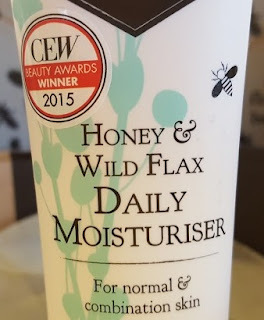 I was sent my Bee Good Honey And Wild Flax Moisturiser to review. This sounds lovely to use! It sound amazing. I love honey smell. This must be great!